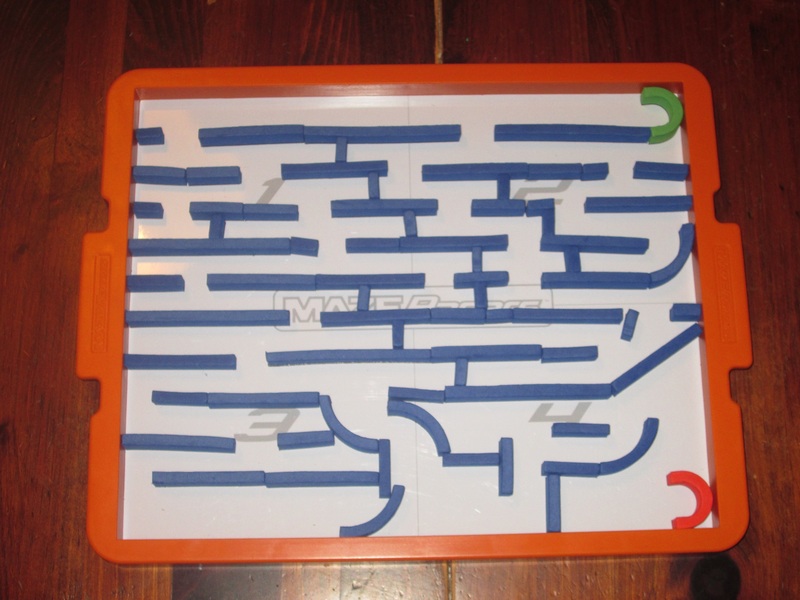 When I was in elementary school, I used to draw mazes for my friends. 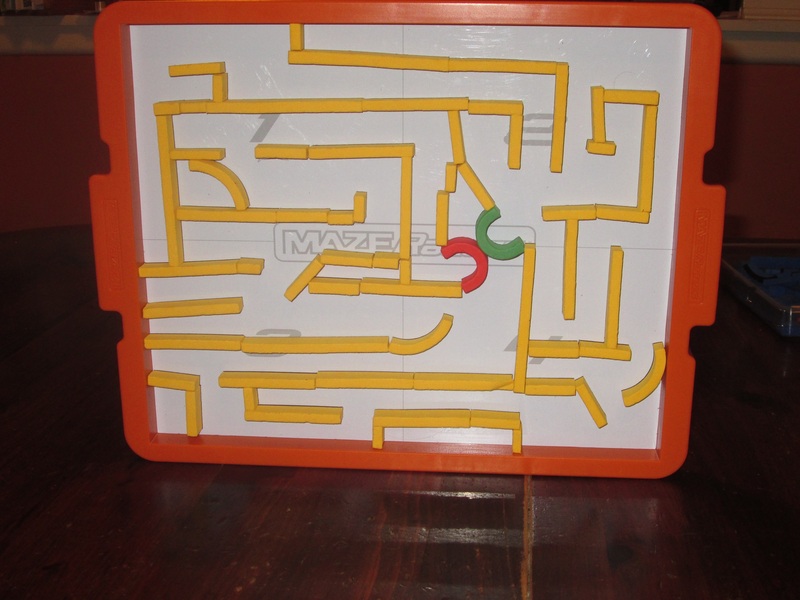 I used to enjoy completing mazes, and that joy found outlet in making them for others. So I was excited to see a game developed that would let me relive this pastime as an adult. Is it any good? Find out below! Maze Racers set up for two players. 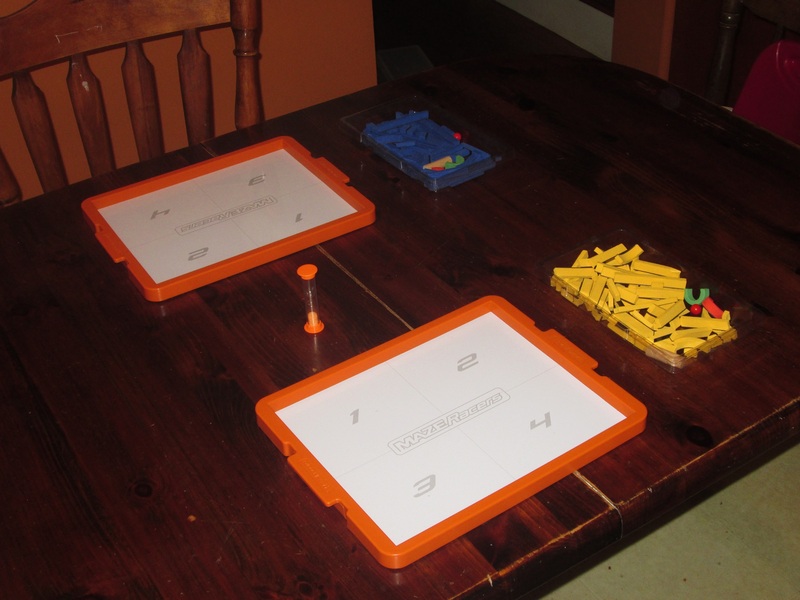 Players take all the wall pieces of one color and one magnetic board. Players decide in which quadrant to place the start gate (green) and in which quadrant to place the end gate (red) and then simultaneously add walls to their boards to create a maze. Walls can go any direction, but the included ball must be able to move freely through the maze. (A spacer is provided for each player to check this as they build.) 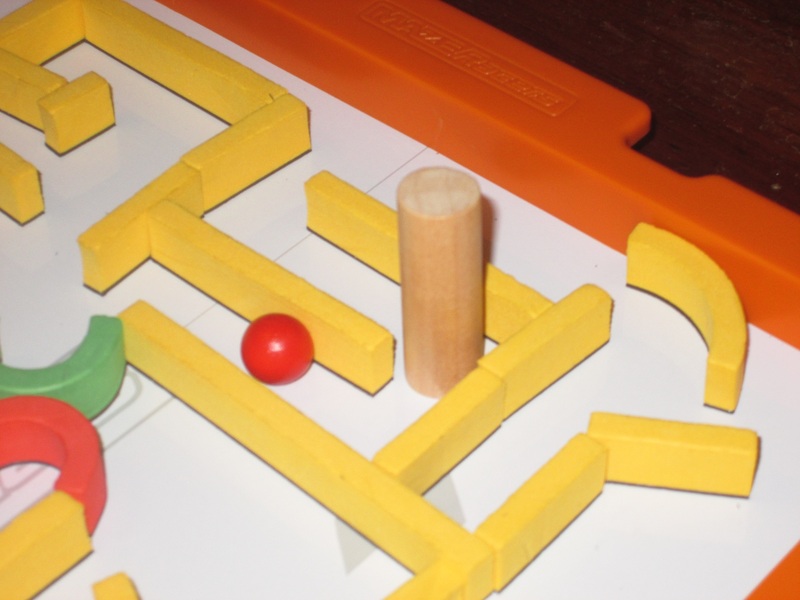 Once one player finishes designing a maze, he or she flips the timer, and the other player must finish designing the maze before the time runs out. Once the mazes are designed, players switch mazes. They place a ball in the start gate and simultaneously try to reach the end gate. The player who gets the ball to the end gate and back to the start gate again first wins. Maze Racers is the kind of game that looks like a lot of fun just from the box cover. In place of the glowering medieval trader or king that adorns most of the box tops in my collection, a smiling, frantic-looking sphere tells observers that what’s inside will make them very, very happy. 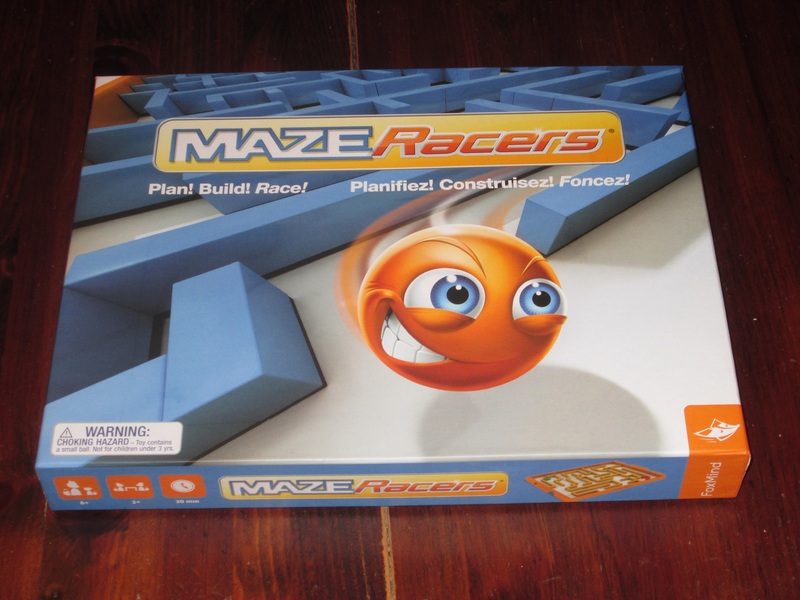 In fact, I’ve come home from work a number of times to find my Maze Racers box askew, only to discover that my four-year-old son once again raided the gaming shelf asking my wife to teach it to him. While the game is a little old for him, the excitement of the package is not. And Maze Racers delivers on the exciting premise conveyed by its box. 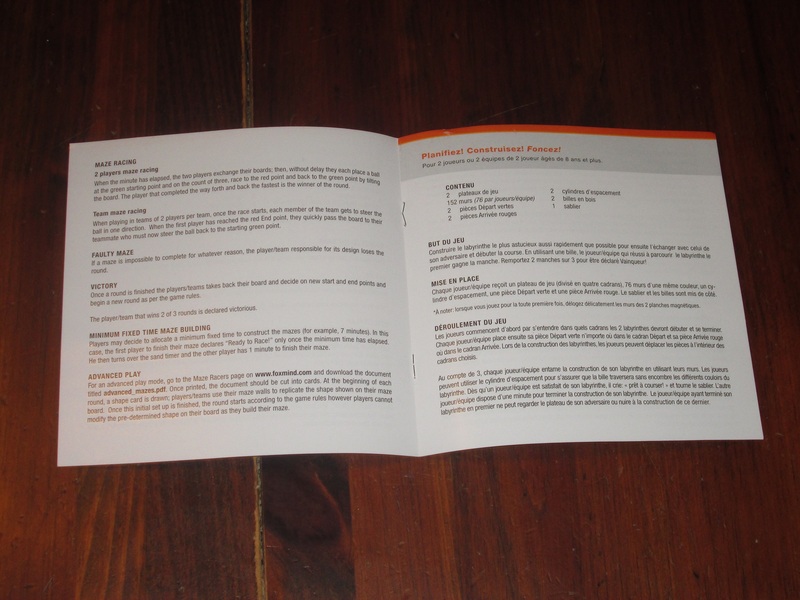 The rules are in English and French and are two short pages. It’s a very simple game to teach and play. Maze Racers reminds me a lot of what makes LEGO bricks so much fun: you have all of these pieces in your toolbox, but what you build is up to your own imagination. Aside from the starting gates (which even these are assigned by quadrant, not by coordinates), players are presented with a completely open-ended problem: create a maze that the other player will have to complete. No, it doesn’t have to be pretty. No, it doesn’t have to take a lot of work. But it always does, just because it’s so much fun to craft something from the included pieces. A yellow maze. In this round, the start gate was in quadrant 2 and the end gate was in quadrant 4. The components are really what make Maze Racers work. The first time we opened the box to play, my wife and I were stunned, first of all, that a premise as cool as this one was determined to be salable at a reasonable price point, and second, that being salable, the pieces are as good as they are. The large magnetic maze boards are great, and the foam walls keep their shape and don’t move around when the ball hits them. 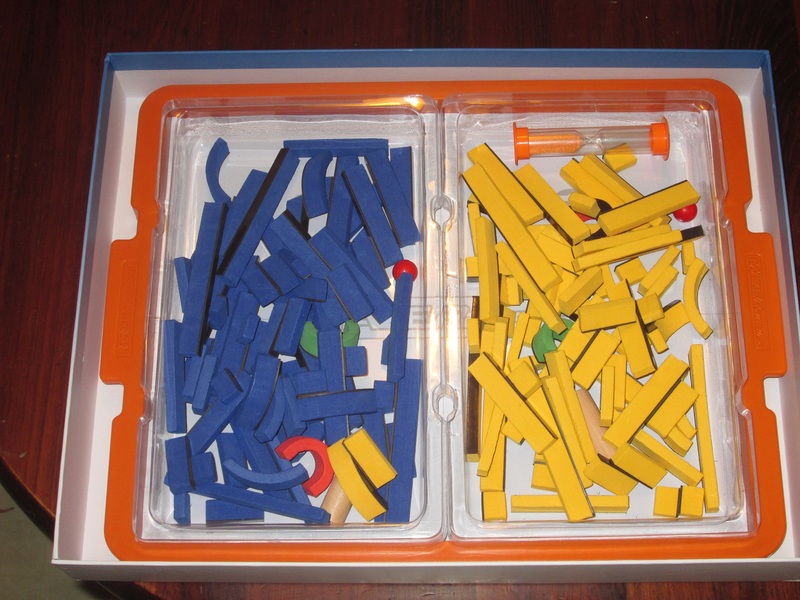 The pieces actually stick to the board where they are supposed to, so the components quickly fade as players are presented with the problem: making a difficult maze. The blue maze using the same parameters as the yellow maze. As one player finishes building, gameplay can get hectic. The neat thing here is that the blueprint for mazes is almost literally limitless. If you can think it, you can make it (within the obvious constraints of the provided pieces). My wife and I were pretty evenly matched in this game. Even though I am better at spatial reasoning than she is, she’s better at dexterity. While my mazes offered plenty of confusing twists and turns, false leads and turnarounds, hers included difficult dexterity challenges. It’s fun to play to your opponent’s weaknesses. A wooden spacer is included for each player to ensure that corridors are wide enough for the ball to pass. Also like LEGOs, Maze Racers seems ripe for home-brewed variants. Just as you can make a different model than what’s on the LEGO box, there are plenty of ways we thought would be fun to play Maze Racers that aren’t sanctioned in the rules. I’m excited to take this game to a small group setting and play it like a party game: have multiple players on a team work together to make the maze, and have two players work in tandem to complete it, each holding one side of the maze board to guide the ball. This could easily work as a pass-and-play group game as well: it’s fun to watch players construct mazes, and a stopwatch could facilitate everyone racing each person’s maze. The rules include some variants, so I feel justified in coming up with variants of my own. I’ve not yet played this game with kids (even my oldest is too young for this), but it seems an ideal fit for this audience, especially children who like the free-form creativity inspired by building blocks. The maze making inspires creativity, and the racing provides immediate feedback on how well you did. And win or lose, the game is fun enough to immediately start another game, building another maze right away. 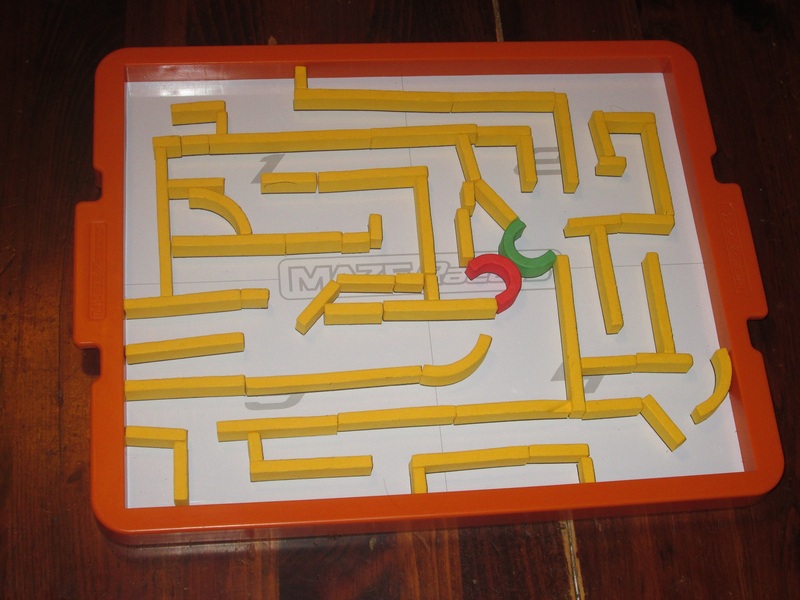 The yellow maze is completely upright, and the magnets show no signs of shifting. Seriously, the components here are great. Everything fits nicely back inside the box and keeps the pieces contained. Maze Racers is a game that fosters creativity and provides the tools players need to do something fun. It seems well suited for both older children and adults. I work with words usually, so this was a fun diversion that allowed me to use a different part of my brain than I usually do. The component quality is outstanding, which lets players forget what they’re working with and simply get to the task at hand. And the task at hand is great fun: making (what you think are) difficult mazes and racing through them. This is a hard game to play just one round of because of the immediate feedback you get in the other player’s solving your maze. This has been a surprise hit in my household, and I look forward to when my son is old enough to join in the fun. 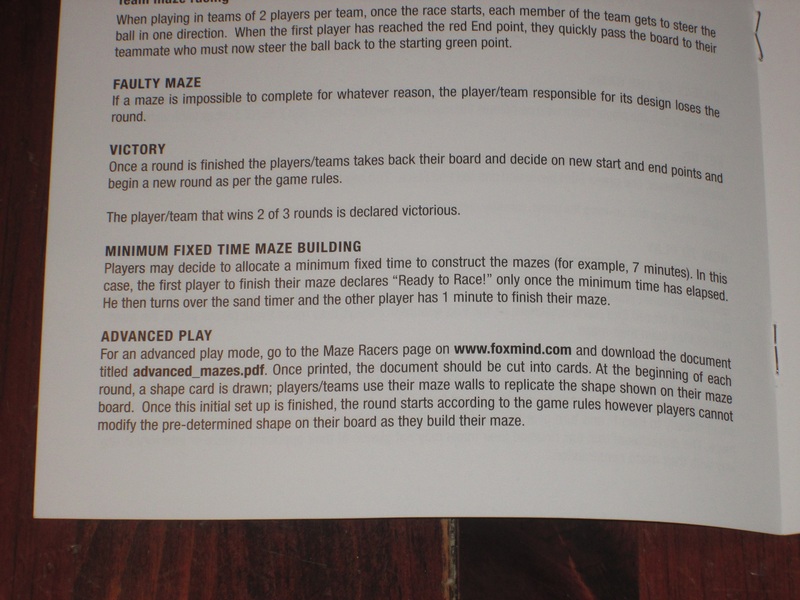 iSlaytheDragon would like to thank FoxMind for providing us with a review copy of Maze Racers. Such a simple concept, it relies on the quality of the pieces. I’m impressed to hear that the magnets are strong enough to not be knocked about by the ball! It helps that the ball is very light wood (to me, it feels even lighter than balsa wood). In any case, it does not move those walls at ALL.